Andrew left for work early this morning and I fell back to sleep listening to the radio. I woke up again at about 7am to the sound of Radio 4 playing David Bowie interviews and songs and talking about him in the past tense. What? He released his new album Black Star on Friday, his 69th birthday, and I’d listened to it in my kitchen, on my new blue-tooth speaker. Then I heard the announcement that he’d died and I came downstairs and made another cup of tea. It all seemed so strange and Bowie-like: to release a new creative work on your 69th birthday and then to die. It was if he’d re-invented dying. Then I checked Twitter and saw the tributes coming in. Words and phrases were on a time loop: ‘legend’ ‘hero’ ‘so sad’ ‘I’m crying’ ‘I’m devastated’ ‘what a loss’. I said to my daughter, Kitty, who’s 16, ‘I’m sad but I’m not going to cry.’ We talked about dying. How it happens to everyone, in the end. How I find it sad when the end comes too soon, when it comes suddenly, when life is taken away before a person can make themselves ready. But Bowie had known he was dying, apparently, and he’d started work on Black Star as soon as he’d heard he had cancer. And he’d released the album to critical acclaim on his 69th birthday. When Kitty switched the kitchen radio from Radio 4 to a music station and they were playing Bowie, I found myself crying. But I’d said I wasn’t going to cry! Then Kitty’s friends, Flo and Imogen, came round to our house as they do most school mornings. Bowie was still playing. Kitty asked if I had a tissue for Flo because she was also crying. And all day the social media tributes came, the articles, the quotes, the snippets of interviews, the images, the anecdotes. I put Hunky Dory on Spotify and I cried again. I know all the words, as I seem to know the words to so many Bowie songs. I danced and cried and laughed. 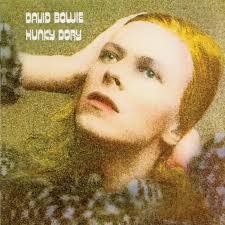 Hunky Dory was the first David Bowie album I owned. It was released in 1971 but I remember listening to it, over and over and over again in 1974 when I was 12 years old. So when I heard it again today, I connected with my 12 year old self again, was in the house I lived in then, was with the same friends, was wearing the same clothes. That’s the thing about music, isn’t it, more than any other art form, it’s so evocative, so emotionally immediate. My tears keep taking me by surprise. What was it about Bowie? As others have been saying all day, he was creative, he endlessly re-invented himself, he broke rules, he was innovative, he was dedicated to his art, he was hardworking, he was consistently interesting. He was quirky but also mainstream. He crossed genres. He sang us stories and ideas and personas. We gave us access to his inventions. How wonderful to have listened to his stream of creativity as a young teenager. He dared me to dream, to imagine, to make. He gave me permission to be playful, to be different, to try different ideas, to be open-minded. I don’t think I’ll ever stop listening. Here’s a link to lots of programmes about Bowie from BBC radio. This is really beautiful Josephine, I feel in such a daze this last week, so I’m really glad I didn’t miss this, it made me sad but it made me smile too. Thank you. I too was a Bowie fan. His 70’s fame is an era that can never be repeated, one Top of the Pops watched by almost every child on a Thursday evening, and discussed the following day at registration and break, NME selling 200,000 copies a week, one chart. That focus exists for no musician now. As an artist he set a fine example- lead, don’t worry how many follow.